Welcome and Thank You for taking time to check out our site! 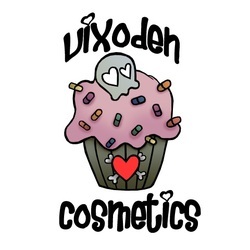 Vixoden Cosmetics was started from the owner love for makeup. I run a small at home cosmetic company which I pride for excellent customer services and well as fast processing time for your enjoyment! All of my shadows are made without fillers so a eyeshadow base/primer is recommended. You can use a small amount of conceler on your lid blended out so its not on think and then pat your shadows (important not to swipe them like you would normal pressed shadows) all over where you would like them. I also enjoy wearing my shadows wet using either a drop of water or visine. I have also formulated a foiling serum that I will be offering shortly to make your pigments pop and have that wet look while dry! I use only cosmetic grade, ingredients that are safe for use on your eyes. I have also listed if you are able to use the pigments on your lips, nails or face for your convenience. Im also able to make custom colors at your request. Make sure to "like" our page on Facebook so you don't miss out on new release colors, giveaways, and awesome sales! https://www.facebook.com/vixodencosmetics Until I'm able to set up my shop on ArtFire and make an official website you are able to purchase from we do all sales via email or facebook fan page using paypal as the payment option. This I feel is the best way as it gives you a security making purchases using your paypal. You can email me your orders at Kims_kreations@ymail.com and I will send you an invoice. If you have any questions feel free to reach me using my contact tab or my email listed above as well as our Facebook page. It means a lot to me to be able to provide high quality pigments at low prices to all my fans and customers. We are always formulating new colors and are always open for suggestions on colors you would like to see!